Those following the news on trials of drugs against Alzheimer's disease must be familiar with the depressing outlook from the front lines. There was a string of failures reported in the last few years for therapies intended to disrupt the beta amyloid protein in AD. The failures have sent researchers back to the drawing board and the beta amyloid hypothesis itself has been strongly questioned. 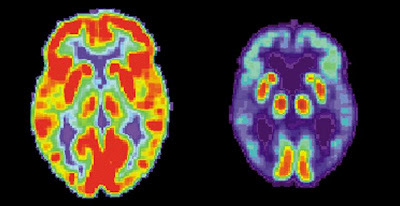 Amyloid is almost certainly involved in some big way with the disease, but its exact role as a causative agent has been under scrutiny for a while now. Several factors could be responsible for the failure of these trials, but one factor in particular was bandied about as an obvious one; perhaps the intervention came too late to help the patients. We now know that diseases like AD and cancer often kick in quite early when they are beyond the detection limit of current diagnostic techniques. Perhaps, the thinking goes, we might stand a chance of beating the disease if we intervene early enough. This thinking is completely sound, except for the problem that there is even now no definitive test to detect AD at very early stages. Fortunately for scientists - and quite certainly unfortunately for those unlucky enough to draw from this lottery - there are certain populations which are genetically predisposed to the disease. Members of these families typically get the disease in their 40s and by the 50s they are completely debilitated by it. The most prominent of these groups is an unfortunate family in Colombia, and the New York Times reported on them in 2010. Now the Times reports on a drug trial designed to test the early intervention hypothesis in this clan. The drug in question is an antibody targeted against amyloid called crenezumab. The antibody was developed by Genentech and the preventative study is being jointly funded by the company, the NIH and a private foundation. Naturally it's going to be a long-drawn project; suspected patients are going to be started on the treatment when they are as young as 30, and their progress will be monitored meticulously over the next several years through both diagnostic mental tests and non-invasive techniques like PET scans. This is a very hopeful and well thought-out experiment, and just like Derek who blogged about this today, I wish both the patients and the researchers the very best. Sadly, the history of the AD trials cited above does not fill me with too much hope. The amyloid hypothesis has constantly been under attack for the last decade or so. The most significant discovery in this regard was the finding that small oligomers of the protein rather than the full misfolded form might be the real culprit; but crenezumab seems to function by attacking the full form. More intriguing and disturbing are the potential consequences for the normal health of the patients. Amyloid is definitely part of the normal functioning of the human body but nobody knows its exact function yet. However, it seems clear that the misfolded and normal soluble form of the protein are in some kind of equilibrium with each other. More interestingly, recent reports have implicated amyloid as an antibacterial agent. There's also some longstanding studies that suggest that amyloid forms free radicals which are usually toxic, but which may also help kill bacteria. I myself had speculated on amyloid's possible evolutionary role as a defense mechanism. All this makes me skeptical about disturbing the normal vs misfolded amyloid equilibrium as a long-term strategy; the process may well be a crucial one, and killing the messenger might kill the message. Everyone wants this trial to succeed but we probably shouldn't be surprised if something disappointing shows up. One thing's for sure; this stuff will generate a lot of data, and that's what science is about. The devil under the hood: To look or not to look? Nanopore sequencing: The next big thing?